H: A lesson I learned this weekend is that sometimes you don't need to match the hatch. I was on the Farmington River this Saturday with friends who are new to fly fishing. Antoine was guiding them. It was surprisingly crowded at Greenwoods during the slow mid-afternoon shift. There was minimal activity in terms of bugs and sporadically feeding fish. I would have taken an afternoon nap, if my friends weren't eager to just be on the water and practice casting. I was having a tough day--bad mojo or something. I had missed about 10 strikes (perhaps they were refusals?) and had hooked a poor little rainbow in the tail earlier that morning. Elsie, Antoine, and Margaret at Greenwoods. Two anglers were leaving as we arrived. I overheard them talking about what they had used. One guy said he must have changed flies at least 7 times, going all the way down to a #32 blue wing olive on 10x (I didn't know they made 10x). The other guy mentioned something about trying tiny midges. Talk about a microscopic crapshoot! And they were leaving without having caught any fish. 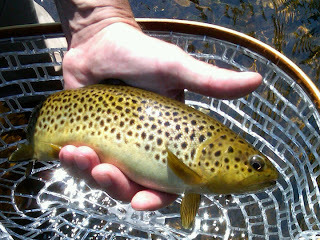 A healthy brown trout from Greenwoods. I looked in my fly box and all I had were small flies. I'd left the big ones back in the car. Antoine came over and proceeded to tie a large iso on my line. He put some gel on it, cast my line out to get the excess off, and sure enough he got a hit. Another nice brown. Later that evening, I finally hooked (hallelujah, praise the trout lord!) and landed a lovely rainbow using that same isonychia, even though there were none to be seen on the water. I've used attractor patterns and terrestrials during those dead times when there's little if any activity. But I would never have thought to try a large, sporadically hatching mayfly. I asked Antoine why the large isos worked and he said, "the trout remember them." Considering that trout have brains the size of a pea, this was rather surprising. When it comes to food, I guess their instincts are top notch. Well, I did some more research and I've learned that isonychias are a particular trout favorite--like candy to them. Because they hatch steadily albeit sporadically for several months throughout the summer and fall, the trout become familiar with them. Al Caucci in Fly Fisherman magazine says: "Trout, especially wild and holdover fish, seldom feed on the surface during sporadic hatches... Not so with the isonychia... My theory is that the trout key on them because they are around so long. 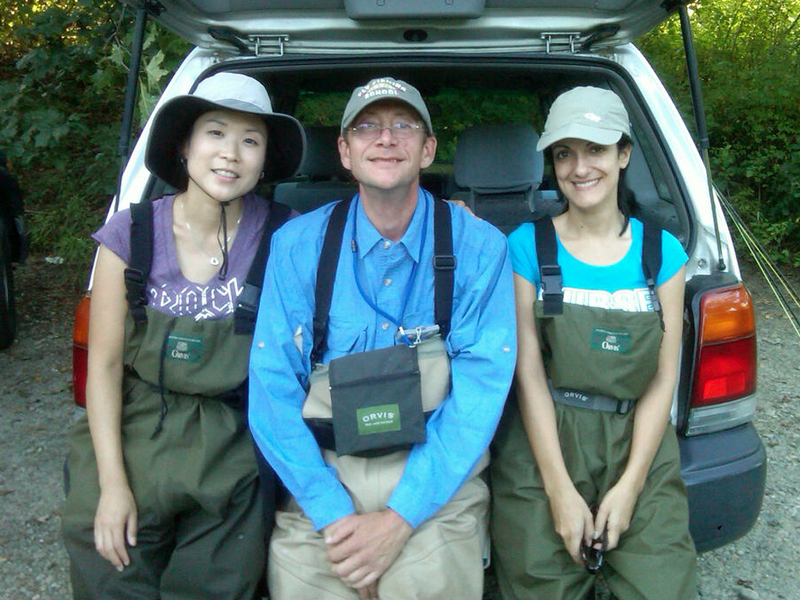 This (late summer) is one of those rare times on the upper Delaware when you can blind-cast the water with a dry fly during hatchless days and still catch fish!" Well, that's good to know. So, rather than matching the end-of-summer micro hatches, why not try an isonychia.